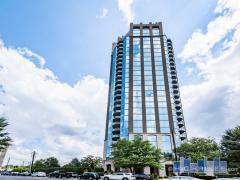 Viewpoint is one of the premier high-rises in the heart of Midtown, close to Piedmont Park, MARTA, grocery stores and the Fox Theater. The lobby is immaculate, the concierge staff incomparable, and the amenities rival any upscale hotel. Features a 24/7 on-site concierge, amazing resort-style pool and outdoor lounge, and other high-end luxury amenities. Even the fitness center has some of the best views in Atlanta! Have any comments or questions about Viewpoint Condominiums? Ask your question and/or share your thoughts about this Building. What are the weight restrictions for dogs?